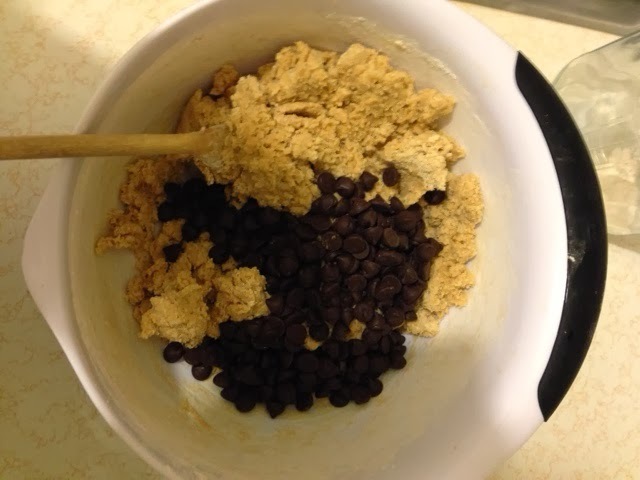 The holidays are synonymous with excessive cookie baking, but let’s be honest, I make cookies all year round. I have seen this idea bantered about in the food blog world for a while. It’s such an appealing, sugar coma inducing idea that I felt compelled to try it out. It didn’t disappoint. It combines the fabulousness of a chocolate bar and a cookie in one heavenly marriage. I used a peanut butter Snickers as the cookies’ gooey innards. This probably goes without saying, but I used a snack size candy bar. 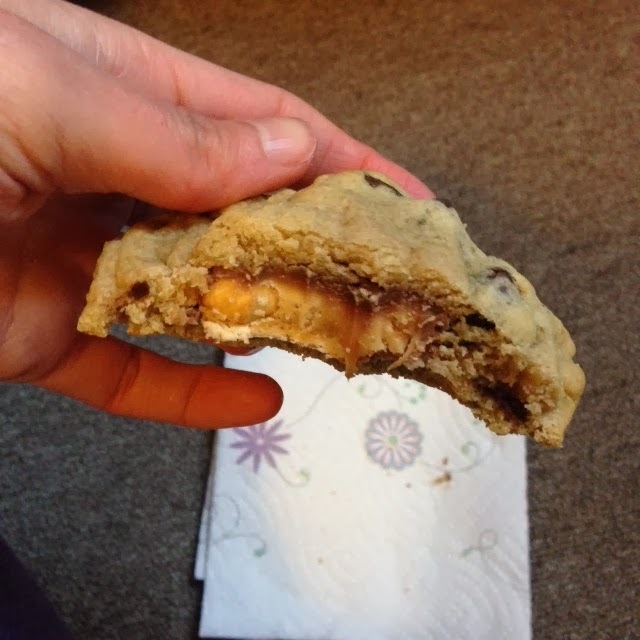 You could probably use a full size candy bar to a make a ginormous cookie, but I’m all about making healthy choices. The cookie recipe came from Allrecipies.com. 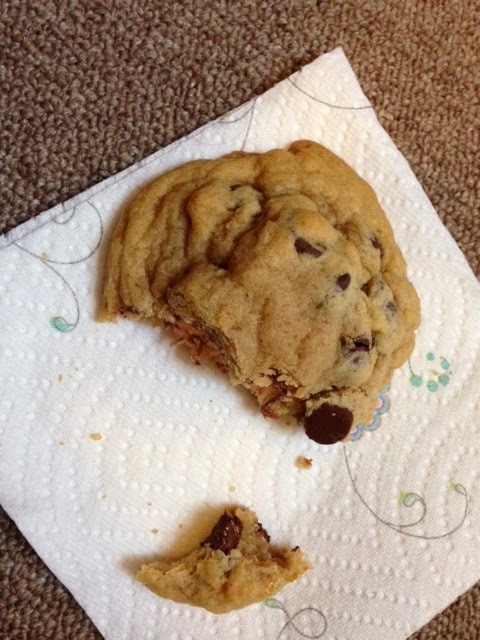 With a name like “best chocolate chip cookies,” how can you go wrong? The ingredients were 12 fun size candy bars, 1 cup butter, 1 cup white sugar, 1 cup brown sugar, 2 eggs, 2 teaspoons vanilla, 3 cups all-purpose flour, 1 teaspoon baking soda, 2 teaspoons hot water, ½ teaspoon salt, and 2 cups chocolate ships. I creamed together the sugars and butter. 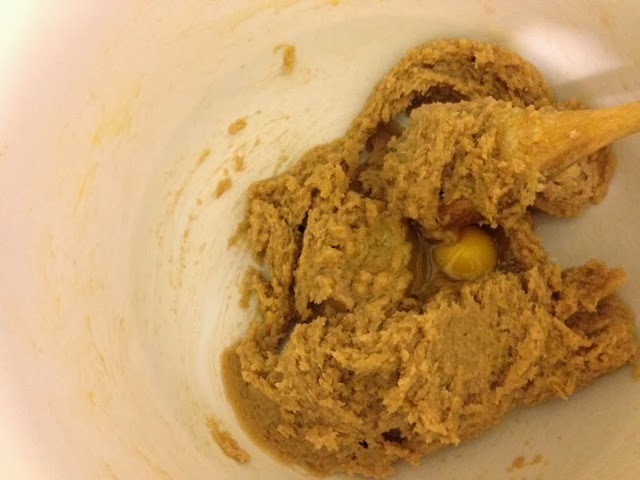 The butter had softened until it was room temperature. This is an important step for those of us who mix by hand. I added the eggs one at a time and stirred after each addition. 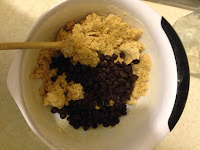 I added the vanilla and salt and mixed. 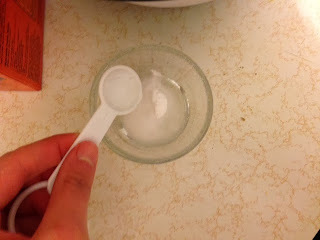 I dissolved the baking soda in hot water. This is an interested step that I have never done in any other recipe. I added the dissolved baking soda and flour to the cookie dough. I mixed until everything was combined. 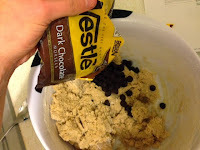 The last cookie dough ingredient was chocolate chips. Saved the best for last! I guess that is why I feel compelled to share three pictures of this step. Once it was combined I stuck it in the fridge for a day. This isn’t required, but I have read from reliable sources that resting the dough makes for a better cookie. 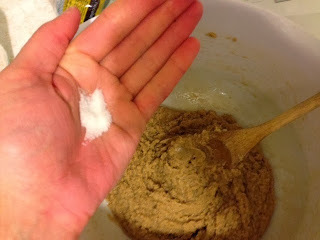 I read on America’s Test Kitchen that resting the dough for at least 10 minutes let the sugar dissolve into the dough. 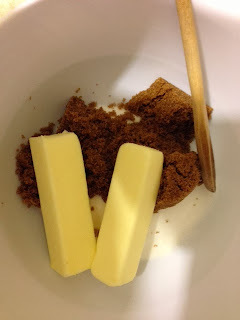 Dissolved sugar caramelizes at a lower temperature which makes for crispier edges. 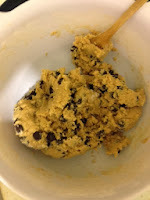 A New York Times article on cookie dough also recommends letting the dough rest. They suggest letting it rest 34 hours as opposed to just 24. This resting period allows the dry ingredients to soak up all the liquids for firmer dough. 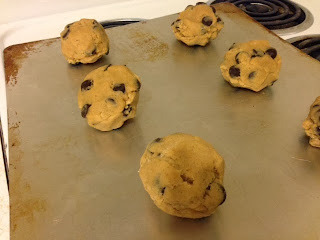 Magically this makes for a more evenly baked cookie with a richer flavor. Weird, but they interviewed many impressive cookie bakers who all agreed on the importance of resting the dough. 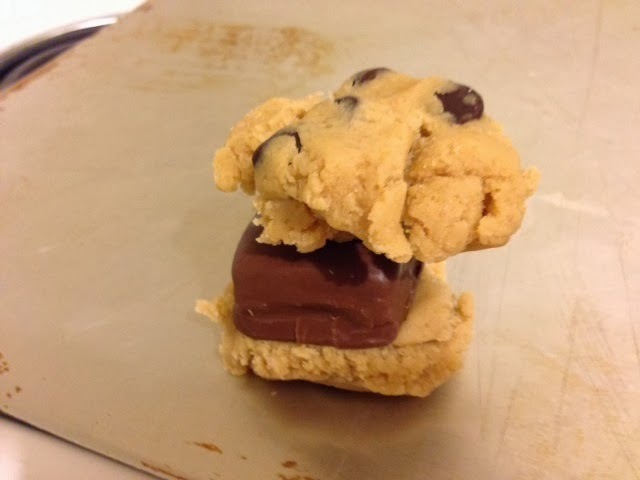 The next day I put a scoop of dough on the bottom and top of each candy bar. 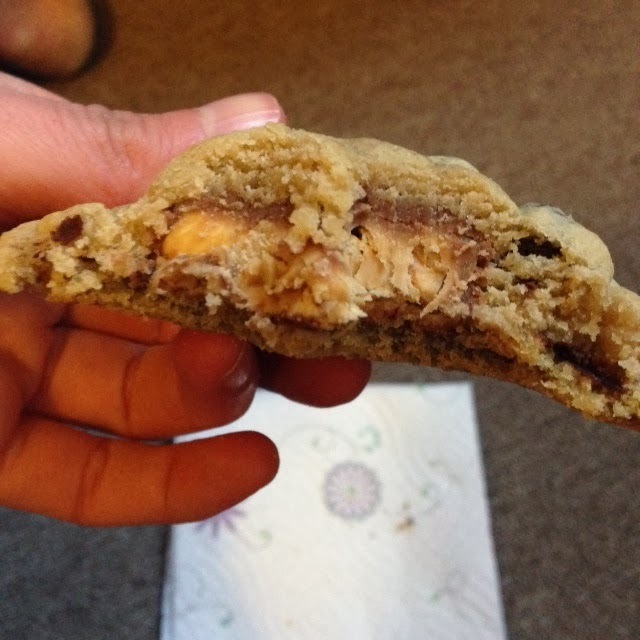 I molded the dough around the candy until it was completely encased. Occasionally, I had to add additional dough on the sides. 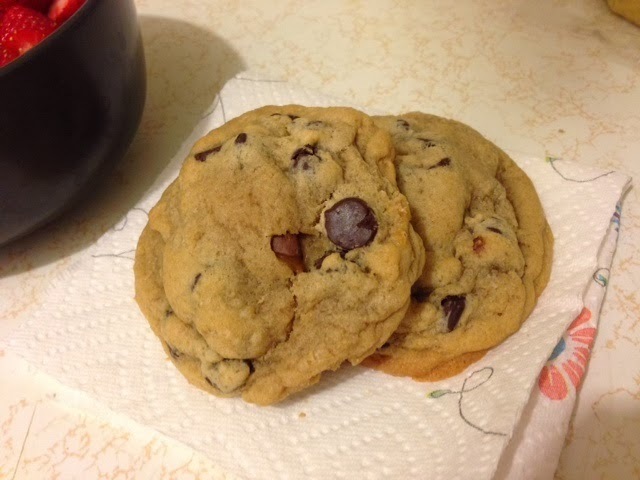 I baked the cookies for 10 to 11 minute at 350 degrees. 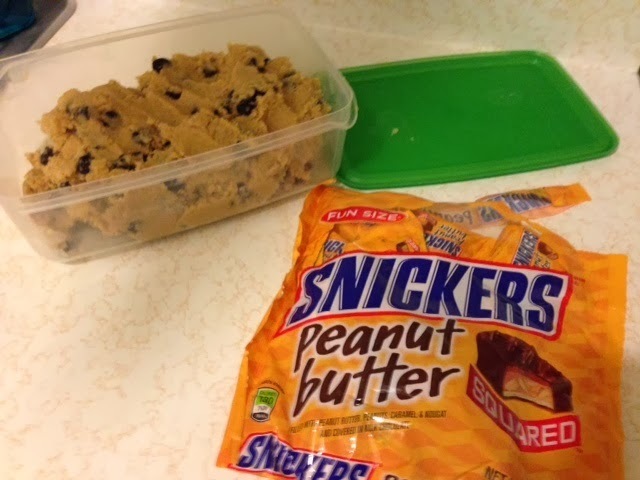 This is an excellent cookie dough recipe. 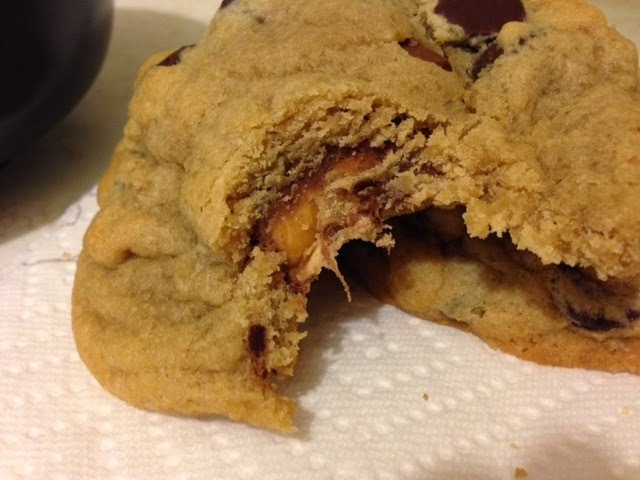 The texture and flavor met all my chocolate chip cookie needs. Adding a creamy, caramel candy center only heightens the delight. 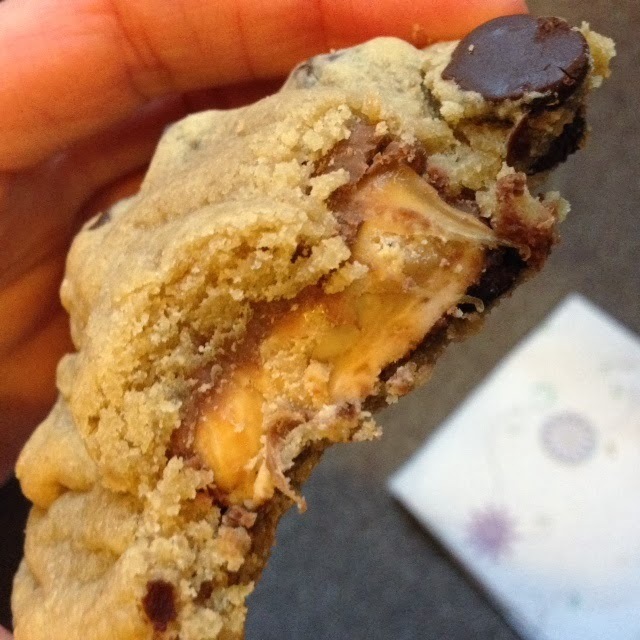 If this picture doesn’t make you want to eat this cookie, nothing will. Just the thought of peanut butter Snickers makes me swoon. It doesn't exist in Australia yet but the American in me can't wait. I love your cookies!